We left Newcastle at half eight on Friday morning, for a first stint to Carfraemill to meet the Beatties and the Fergusons. We had a great journey up, cruise control was on for about 80% of the time, and we saw a few Harley-Davidsons on the way. Brian and Matty arrived just ahead of us as we fuelled up in Lauder. Then Paul and Dawn arrived and we were off again to Kinross services, with Brian leading the way. We parted company with our leader when he went straight on at the M8 junction but, in a scene you couldn’t have made up, he re-joined right at the front of our group just before we headed across the Forth Road Bridge. The new Forth Crossing was looking spectacular on our left-hand side, with only a few more pieces to go in the structural jigsaw before the deck is complete. Soon enough, with a couple of light showers along the way, we landed at Kinross and there were quite a few bikes there. We met up with John, John and Vanessa. Burger King provided the necessary fuel for our travellers, and we were off again pretty soon. There were quite a few more bikes in the service station, with people coming and going all the time. The sun shone on us as we whizzed up the A9 and we saw some of that amazing Scottish scenery – rolling hills, deep valleys, colourful heather and … distilleries. Brian saw us all safely into Aviemore, and we joined the queue for registration. Seven hours from home to registration, not bad at all. The Macdonald complex was absolutely buzzing with bikers, bikes and hi-vis people generally directing and helping us. 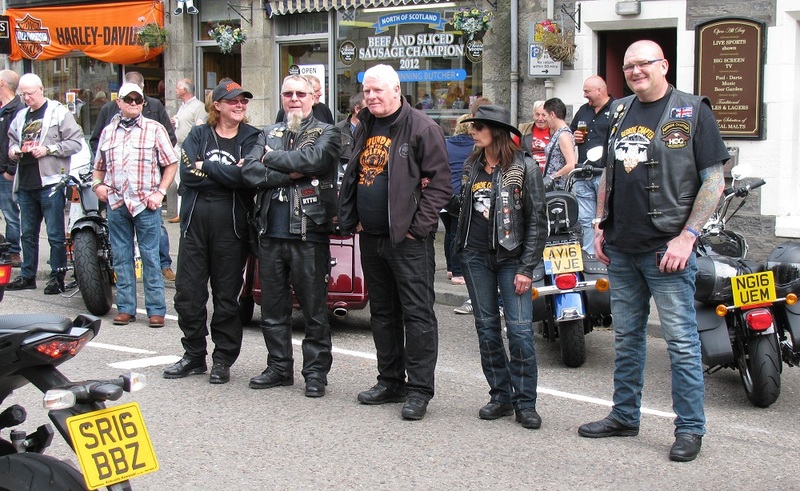 We’d only been off our trike for a few minutes before we were chatting to someone new about the trip, Harley-Davidsons, the weather – everyone was extremely friendly. Registration was exceptionally smooth and we collected our rally packs. 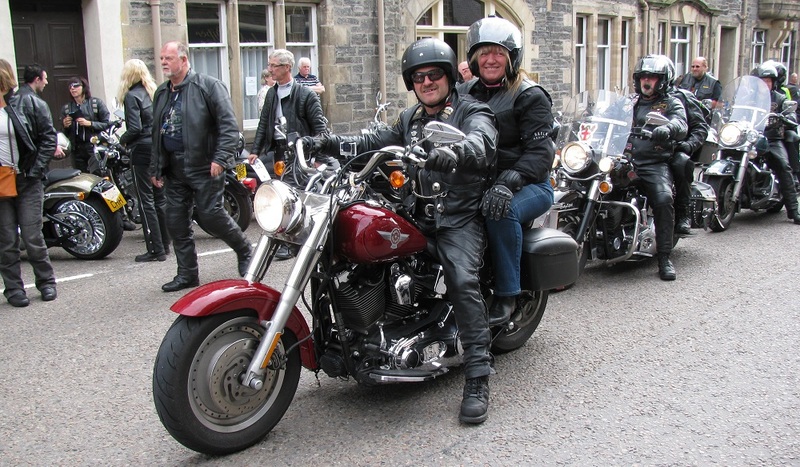 We had a quick scoot up the Grampian Road, to soak up some early Thunder atmosphere, and we saw Lyn, Ron and Steve taking a breather. The whole place looked absolutely amazing. Banners, flags and posters were everywhere: there’s no doubt we’d arrived at the right place … ! We made the first of several visits to the petrol station, then off to the hotel. They’d cordoned off a bikes-only section in the car park, accommodating about eighty bikes from across the UK and Europe. Fully refreshed, we walked back into Aviemore and arrived at the Cairngorm Hotel about seven. Rob was on hand to take a Geordie Chapter picture, and we passed the time with some great friends and some great beer. The Heavy Drapes were just starting as we landed at the Osprey Arena, and they were belting out a sort-of-new-punk-style set. Very fast and furious. We watched them for a while, then headed over to the Strathspey Hotel to see Matt Black, with quite a few other Geordie Chapter members. A superb pianist, he treated us to a full range of stuff, from Titanic in Four Minutes to Van Halen’s Jump. 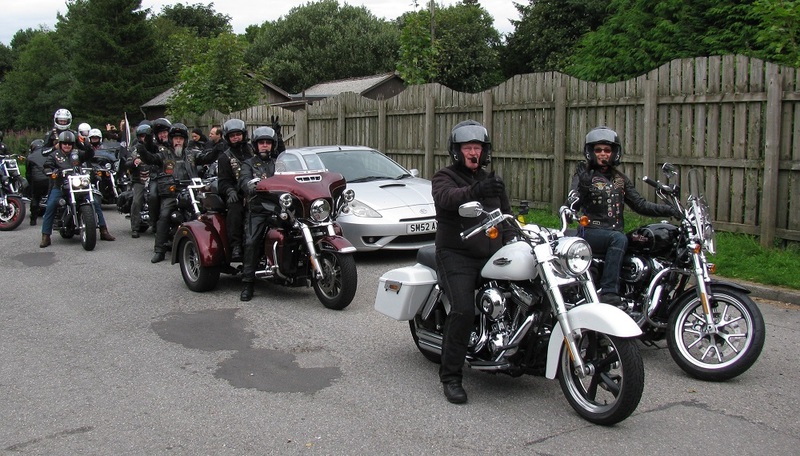 On Saturday, we headed down to the ride-out line-up about half ten. 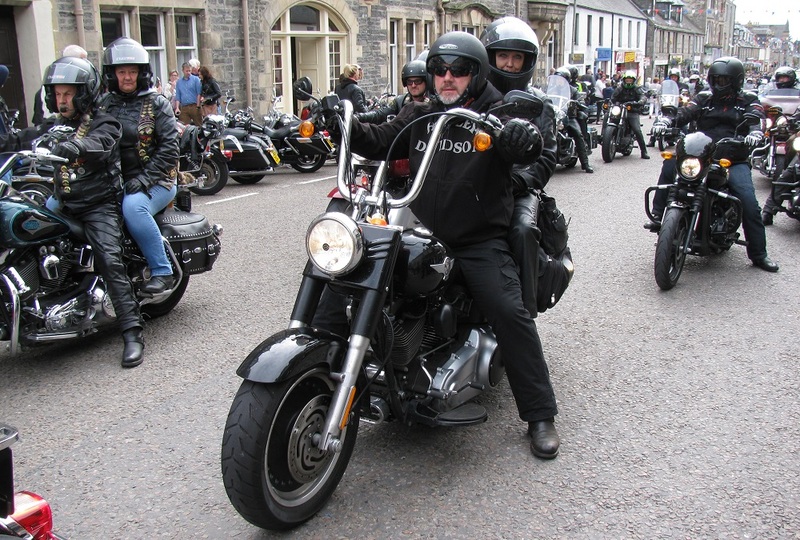 The queue was already in full swing and Bill kindly piped us aboard so we could ride along with a small group from Geordie Chapter. Barry was much further up the field, with the Geordie Chapter flag fluttering in the wind. After a brief wander round the merchandise, we were back in the saddle at twelve, ready to go. The line-up behind us stretched for hundreds of yards, right round the complex, with bikes and trikes three abreast just to get them all shoe-horned in. Once underway, we saw hundreds of people line the route, pretty much from the start, as we headed up the Grampian Road out of Aviemore. 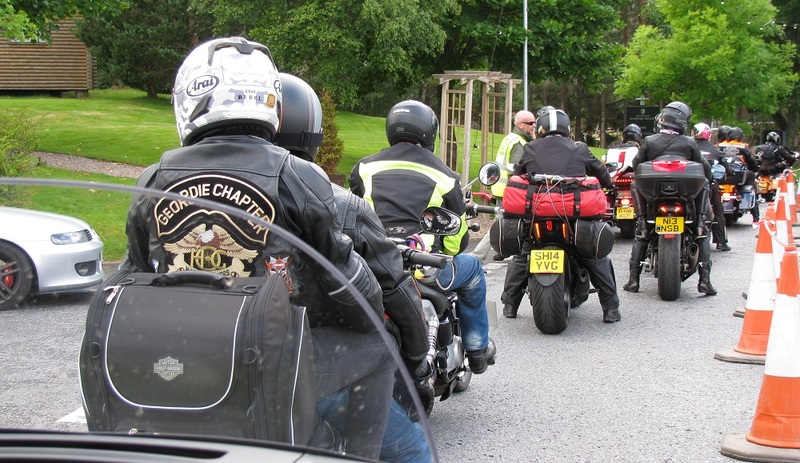 The Dunedin Chapter Road Crew marked all the junctions for us as we ploughed on through Boat of Garten, Nethy Bridge and our first visit to Grantown-on-Spey. The ride was very smooth, with no hiccups or interruptions along the way. The most amazing thing was seeing everyone who had come out to wave and cheer us on. Each little village had new groups of people – some had even brought deck chairs and sandwiches, all set for the day! We also encountered lots of people filming our ride-out and there were a few drone cameras buzzing about in the sky too. The shores of Lochindorb were soon within touching distance, as we headed from the most northerly point on our trip, the junction of the A939, about eight miles north of Grantown-on-Spey. The weather had turned cooler and slightly cloudier, but at least it wasn’t raining. 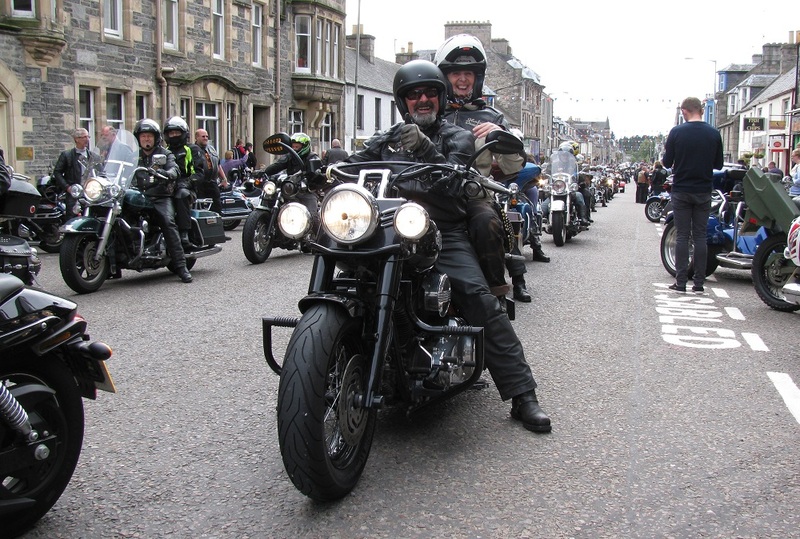 We soon completed our loop and landed back into Grantown-on-Spey, with Dunedin Chapter calmly directing us into parking spaces. Once we stopped, we watched everyone filter past us. 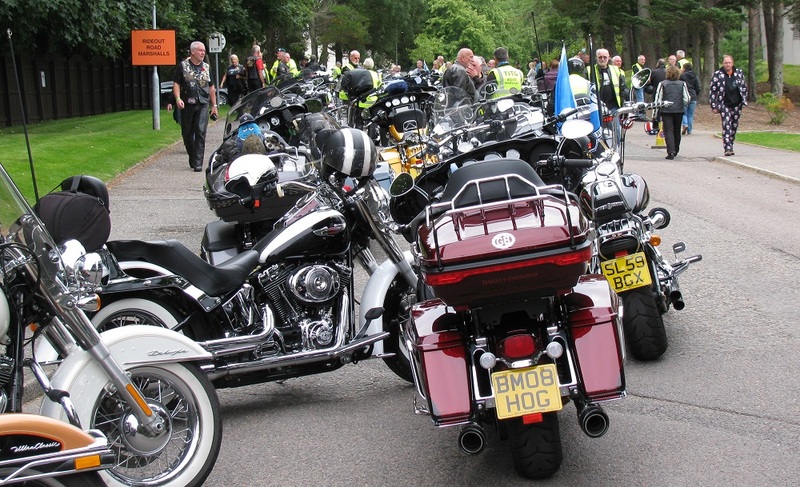 What a fantastic sight … on and on they came, hundreds and hundreds of bikes and trikes. There was no official count but George McGuire quoted about two thousand to the local press. It certainly seemed like it. Right at the back, we had some enormous American V8 muscle cars. The sun was shining brightly while we were there, so it was time for a can of pop to cool down. We didn’t wander too far from our steed – there was always someone new to talk to and share experiences with. We travelled back to Aviemore, along the A95, with Chris, Ruth, Ray and Lesley. They peeled off to their lodgings in the north of Aviemore and we braved the Grampian Road again. It was absolutely solid with bikes and cars. 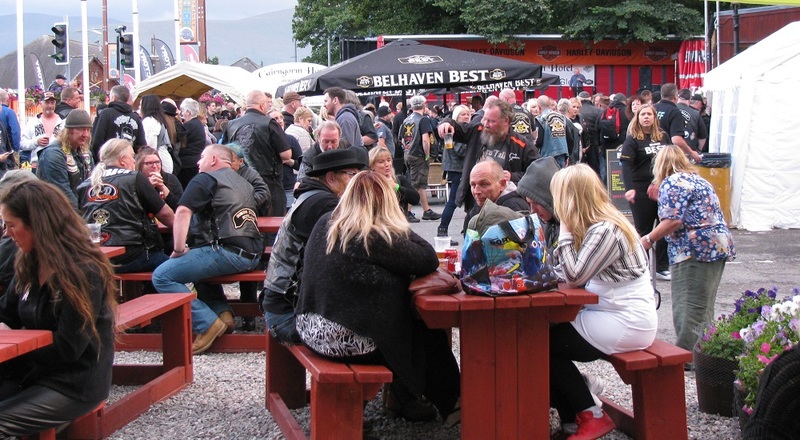 This gave us some time to see everything going on further up – Edinburgh H-D, West Coast Harley and Jeep all had stands and demo rides available. We landed back up there later on, at the Winking Owl, for some more beers and bands. Everywhere we looked, there were people that we recognised from our own Heart & Soul Rally. As darkness fell, we headed back to the Cairngorm Hotel and then into the Osprey Arena for Live/Wire at ten. It was a blistering performance and the place was packed. Bon Scott took us through Sin City, The Jack and Livewire, then Brian Johnson put the Rock ‘n Roll Train on a different track with Hell’s Bells, For Those About to Rock and Thunderstruck. A very fitting song for the event! Sunday was a bit damp from some overnight rain, and the fog lingered. We eschewed the official ride-out to the Cairngorm and headed up there on our own about half nine. The ride was great, past Loch Morlich, but the midges were horrendous when we landed at the ski-lift! We kept our helmets on, and visors down, just to keep them out. After some pictures up in the clouds, we headed for Inverness, via the A9. 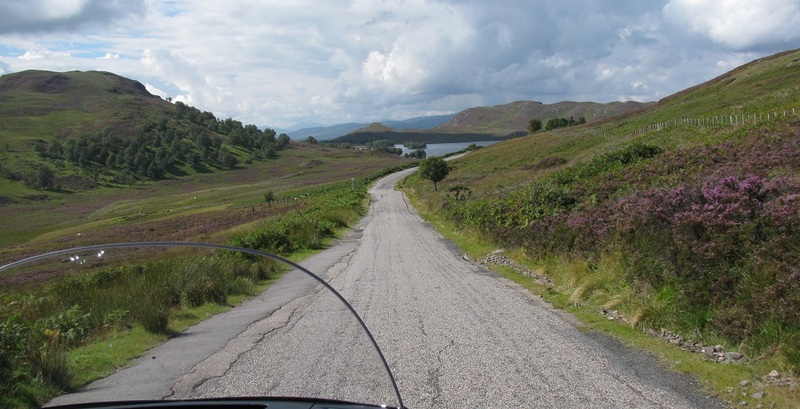 We decided to circumnavigate Loch Ness, first on the B852 and B862 through Dores and Foyers, then up the sunny side on the A82, through Drumnadrochit. The scenery was, again, fantastic – a couple of highlights were the trip down from the Suidhe Viewpoint to Loch Tarff and then Urquhart Castle on the other side of the loch. The sun shone pretty much all the time we were north of Aviemore. We saw lots of Harley-Davidsons on the way, some in groups and some riding along alone. We’d covered about 160 miles when we landed back in Aviemore, just missing the rain that had obviously fallen while we were away. 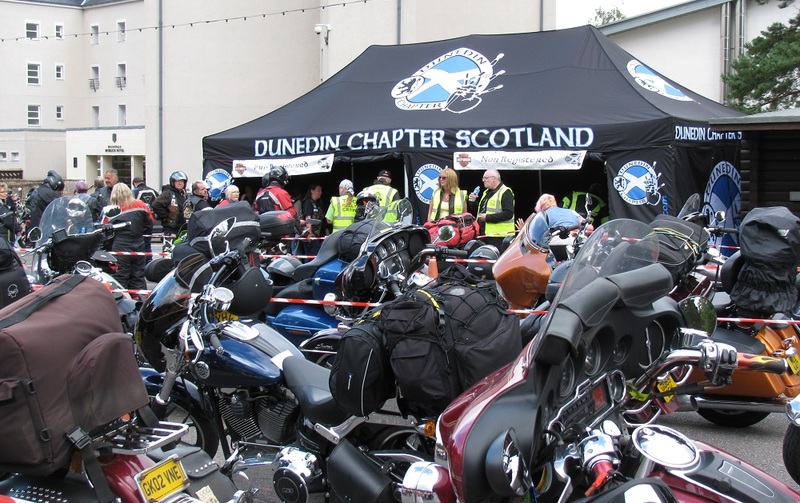 We got the trike shackled and covered again and after tea, we were back to the Osprey Arena for Clann an Drumma, a Scottish tribal drumming and bagpipes band. The arena was packed again as they took us through a rousing set including their own Thunder in the Glens tune. Then Rick Parfitt Jnr, with the RPJ Band, got the party really moving with his extravagant stage performance and audience participation. Thank you and goodnight, Thunder in the Glens! Our trip home was just as entertaining as the way up, just with more sunshine. We dodged in and out of light traffic, with some other riders along the way, and landed home at two o’clock with only one stop at Jedburgh. 720 hugely enjoyable miles for the weekend, with our friends from Dunedin Chapter. Great organisation, great people and great fun! We have some more pictures on our flickr site, click here.